Marine safety, along with all industrial safety, needs to be approached proactively to protect workers and employers. When it comes to safety, a reactive approach could cost time, money, and potentially cost lives. It only takes one small mishap to cause irreparable damages. In a shipyard a welder and his assistant were installing guardrails on a marine dock. The work was being done from a smaller barge that was tied to the dock. As the work progressed, the smaller barge was moved alongside the dock. On a very cold day there was ice build up on the deck which made the walking surfaces very slippery. While the welder was finishing up a few sections, his assistant reached around the corner of the dock to take a measurement. When the assistant reached around the corner he slipped and fell into the water. The welder then ran to help him but could not reach him so he then had to run for help. When the welder returned his assistant had disappeared under the water. This is a perfect example1 of an accident that could have been avoided if actions were taken previously in a proactive manner. If the welder’s helper was fitted with PFDs, or attached to a secured structure as a fail safe, the incident may have been prevented. There should have also been resources readily available such as life rings with at least 90 feet of rope attached and a ladder. These must be available and in the vicinity of the work area. Taking the time to step back and evaluate current processes and procedures could decrease potential time lost, insurance and workers’ compensation premiums, and damage to products or property. Safety and Health Magazine states that for every dollar invested in worker safety an organization could save $3 – $6 in future savings2. Customize a solution that fits your situation – Every situation can differ based on location, operation type, time of year, and the personnel on-staff. Keep all situations in mind when creating a strategy and solution to make your environment(s) safer. 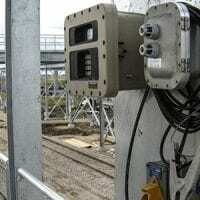 Install reliable and proper equipment – Installing safe equipment such as dock gangways that have reliable usage will help greatly decrease the potential for on-job risks. Purchasing equipment from a reputable company that can fit your situation(s) is key to have equipment you can trust. Not only do your employees need to trust one another, but they also need to trust the equipment they are working with. If the craftsmanship of the equipment is sub-par then damages can occur and employees will be unsafe. Invest in training for new and existing employees – Training and knowledge is power. This power gives employees the ability to act safe, be safe, and prevent unsafe situations for themselves and others. Take the time to set up training programs on best practices, company processes, and how to operate the equipment safely. While it may not be relevant in the present, it could save a life in the future. Get an outside assessment and consultation – In most cases, including safety and production, getting a third party and knowledge source to take a fresh look at your operations could bring up instances of improvement that you or your employees could not see. The trick is to get a consultant that is very knowledgeable about your industry and standard processes, but someone that is not familiar with your operations, to begin with. This combination leads to a fresh set of eyes to give helpful and constructive feedback for ways to improve and save. It is never a bad thing to ask someone for help, especially someone that is properly equipped to do so. The motivation for a safer work environment needs to be instilled from the top down. Each employee needs to be on-board to make the optimal safe work environment. This means every employee needs to be involved in training, certain decisions, and all feedback. SafeRack quality in the marine industry. Our advanced corrosion-resistant aluminum ship gangways are designed for durability and reliability in marine environments. 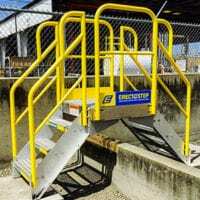 Engineered with OSHA-compliance in mind, our marine gangways are built to order to the unique standards of your job site. Constructed of durable aluminum, galvanized or stainless steel, our truss gangways are available in sizes up to 50′ in length and 5′ in width. 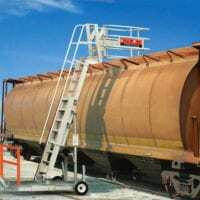 Special-purpose gangways exceeding these measurements can also be designed and engineered.